Filedex has carefully selected a range of night deposit safes for companies and customers looking for added security during after hour deposits, combined with the quality security of dial safes and electronic combination safes. These night deposit safes are designed for optimal security, featuring simple deposit space that doesn’t require you to unlock when depositing money. The night deposit safe safes are popular in banks, for customer deposits that are after opening hours. The reliable durability reduces the chance of theft and a range of sizes are available to better suit your personal needs. 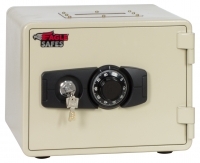 The Eagle Night-Deposit safe offers the convenience of multiple usages. A normal safe during the day, a deposit safe at night. The Front loading deposit door comes equipped with anti-fish baffles to prevent theft. A full length locking bar deter prying attacks on the hinges. It comes equipped with a key lock, and a choice of a resettable combination lock or electronic push button keypad. Ideal for use in places with cash transactions. If you wish to enquire about our night deposit safes that have been designed for a variety of uses, get in touch with Filedex today. We have a variety of safes available in Singapore for private and commercial use, so you are sure to find something best suited to your purpose. For more information, call our hotline on 6275 4088 or fill in your details online and we’ll get back to you shortly.